Additive manufacturing (AM), also referred to as 3D printing, is a layer-by-layer technique of producing three-dimensional (3D) objects directly from a digital model. Additive manufacturing is increasingly being used for maintenance and repair of damaged parts, particularly for products where a long lead time or expense is associated with procurement of new parts. The ability to repair metal parts to near-net shape has significant advantages over manufacturing new parts, particularly large parts where only a small portion has been damaged. A layer of a substance spread over a surface for protection, decoration or safety (e.g., painting, plating, non-skid coatings, etc. ); a covering layer/the act or process of surface modification for the purpose of preserving, controlling, or preventing corrosion or wear/erosion (e.g., thermal spray, weld cladding, etc.). Cold Spray is a low-temperature, solid state consolidation process, whereby metal or combinations of metallic and non-metallic particles are injected into a high-velocity gas stream and are directed upon a suitable substrate where they impact and consolidate to form a coating or freestanding structure, without melting. The cold spray process can be used to provide dimensional restoration and a means to repair worn and/or corroded parts fabricated from a variety of materials including aluminum, titanium, magnesium and steel. It is being used to form corrosion and wear resistant coatings. MRO of components made of non-metallic material composites (e.g., carbon or polyamide fabric, ceramic, glass, resin, etc.). Similar to Metal Working. 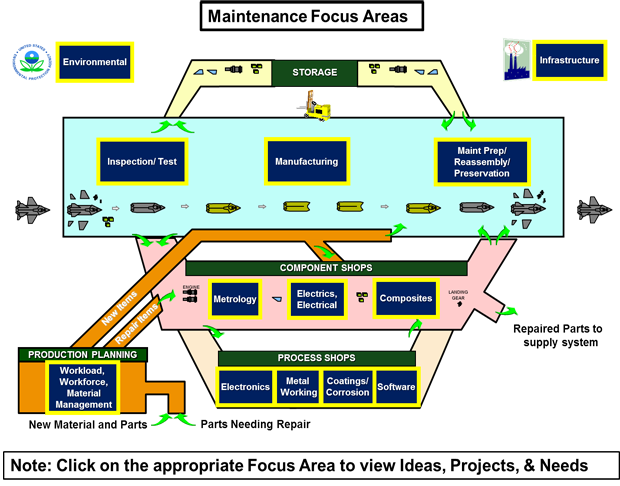 Relating to the MRO of systems/components used for production and delivery of electricity to systems. Processes and/or equipment used for the MRO of electronic systems, and/or to restore to operating condition after damage and/or deterioration. Relating to or being concerned with the ecological impact of an action or process on the environment during MRO. (e.g., technology insertion projects that relate to occupational safety & health, HAZMAT handling, and the reduction of air, water, solid pollutants, energy use, and hazardous waste). All buildings and permanent installations necessary for the support of depot MRO. A physical scrutinization of property or documents / a procedure that ascertains effectiveness, value, proper function, integrity or other qualities during MRO. Includes Non Destructive Inspection (NDI), hydro test. Etc. The act of preparing equipment for induction to MRO/ the act of reassembling an asset upon completion of maintenance activities/ the act of preserving equipment for future use. Processes in or in support of MRO beginning with raw materials to produce a component, (e.g., design, reverse engineering, reengineering, casting, milling, painting, inspections, etc.). This category also includes additive manufacturing and repair, rapid manufacturing and prototyping. The act or process of restoring, reshaping, and repairing existing metal assets using industrial processes such as welding/joining, forming/forging, grinding, machining, drilling, coining, cutting, etc. MRO of components in the area of the science that deals with measurement or a system of measurement or calibration. The repair, adaptive modifications or upgrades, and change events (including integration and testing) made to operational software resident in a weapon system or in support equipment that is integral to the operations or sustainment of a weapon system. This can include the modifications or upgrades necessary to ensure safety and relevance in operations and interoperability with other systems. The management of:- work produced, or can be produced, in a specified time period- the workers employed in a specific project or activity- all activities concerned with the ordering, storage, and movement of materials.